Don’t just dream about being a mystical creature. Do it. It’s not fair to make generalizations, but everyone straight-up loves unicorns. Maybe it’s the animal’s curious, ethereal mystique. Or maybe it’s all Lisa Frank’s fault. Regardless of how the obsession started, we’re here to indulge it. 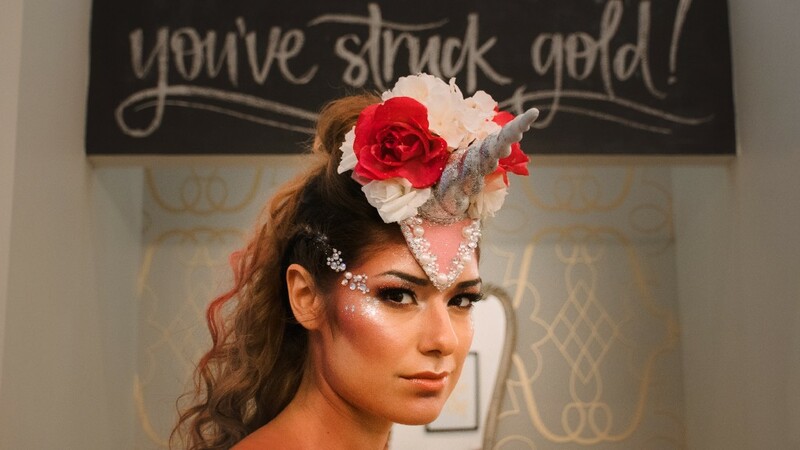 Chicago’s resident beauty experts at Goldplaited showed us how to transform from mere mortal to unicorn. Here’s the step-by-step metamorphose for your next Halloween, night out or rainy day — whatever feels right. Step 1: With a medium-sized round brush, apply a light pink eyeshadow (we used a NYX shadow palette) from the lash line and up to the crease of the lid, blending just like you would to create a smoky eye. Step 2: Define the same area by using a slightly darker pink. Pro Tip: If you work between the eyes — hopping from one to the other throughout the process — it will help keep the look symmetrical. Step 3: Use the small brush to layer purple eyeshadow in the inner-most part of the crease. Step 4: Cover the inner lid from the crease down with white or blue cream liner (we used Kryolan HD cream liner). Set the cream with a blue shadow using a flat concealer brush. Step 5: Highlight the interior (near the tear duct) with white shimmer shadow, then sweep that same frosty white under the brow arch. Step 6: Move along the lash line with a black gel-liner—we used L’Oréal Infallible Gel Lacquer Liner in Blackest Black. Step 1: Apply concealer as a base, followed by foundation. Step 2: Dab liquid highlighter (we used BECCA Shimmering Skin Perfector) on the highest points of the face—cheekbones, forehead, top of nose, top of lip and above brow point. Pro tip: Apply eye makeup before foundation/concealer to help clean up any fallout that might occur from shadow. Step 3: With the same pink shadow used on your eyes, contour under your cheekbone and along your hairline. Brush color on jawline and all along the neck. With the purple shadow, go back over the contour to add depth. Step 4: Trace pink shadow above and below the collarbone, then apply liquid highlighter. Step 5: Dab frosty white shadow to add ultra-shine to the top of the cheekbones. Step 6: Apply adhesive gems on all the unicorn-y spots, using tweezers to get the placement just right. We got our rhinestones at Michaels, but they’re also available on Amazon. Step 7: More glitter! 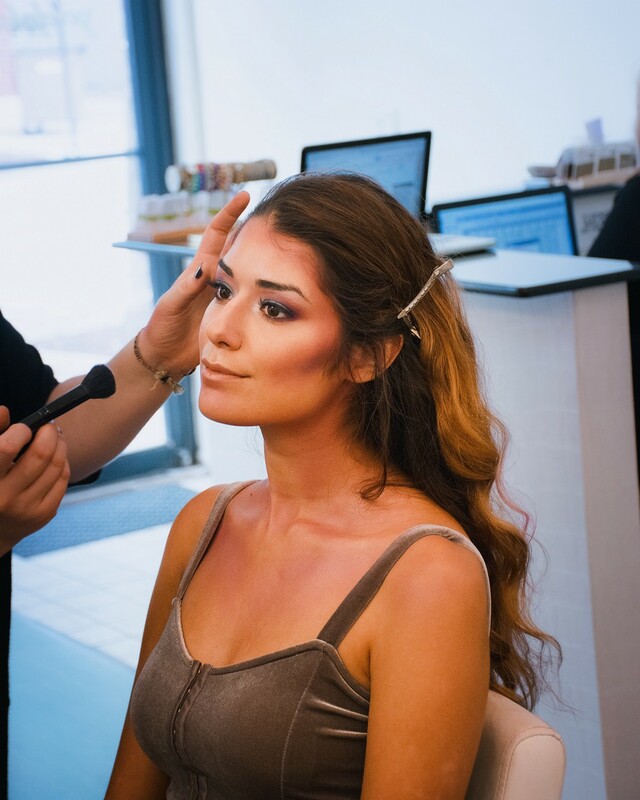 We used Stila Magnificent Metals Foil Finish Eye Shadow in all the key spots to ensure a truly ethereal glow. Step 1: Curl ends of the hair. Step 2: Apply hair spray to the curls you want to color, then run the chalk down to the ends (we used Kevin Murphy’s Color Bug Shadow). You can choose to color all over or select a few strands, like us. Step 3: Create a dutch braid on either side of the head. Don’t know how to dutch? We’ve got you covered. Step 4: Grab a two inch-wide section of hair from the top of the head and tease it high with a rat tail comb. Pro Tip: To avoid tangling, tease down and pull the comb back out horizontally, instead of frantically moving the comb up and down. Step 5: Repeat on four more sections, working from front to back. End at the crown of the head. Step 6: Wrap the ends of both side braids around the bottom of the head and secure with bobby pins. 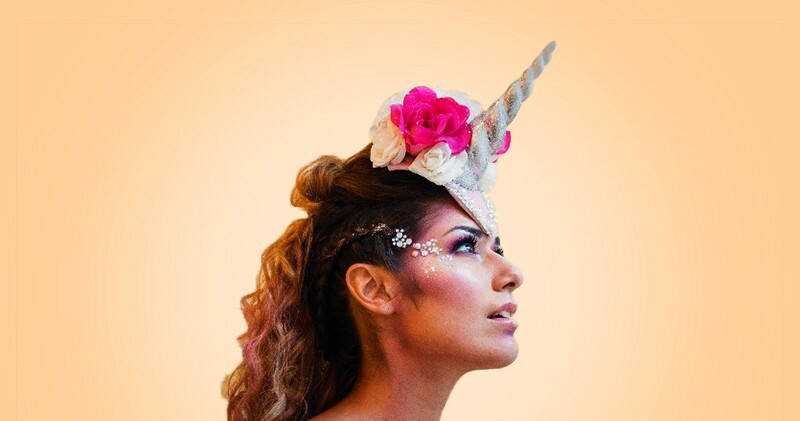 We made our magical horn head piece from scratch, but you can also buy one on Etsy. A very special thanks to Goldplaited for making all our unicorn dreams come true.